SLINGERLANDS — Tyler Witazek got to live a dream so many others before him never had: to play on a Major League Baseball field. Twice. 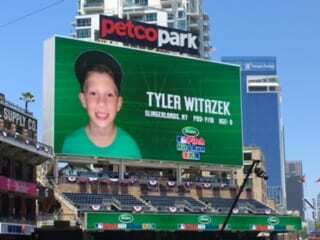 Witazek, an 8-year-old who plays for Guilderland Little League, participated in the national finals of MLB’s Pitch, Hit and Run Competition during last week’s All-Star Break festivities at San Diego’s Petco Park. 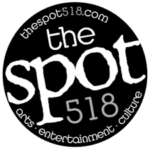 That came on the heels of winning a regional competition at Yankee Stadium last month. It was also exciting for his family, who made the cross-country trip to see Tyler play on the same field as Major League all-stars such as David Ortiz, Kris Bryant and Jose Fernandez. Competing against two other young ballplayers, Tyler had the longest distance in the hitting competition and had one of the fastest times running the bases. The lone setback was in pitching, where he finished third in his age group – which is where he finished overall, as well. Joe said Tyler was disappointed by his performance, but he helped put things in perspective for his son. Tyler’s Major League adventures didn’t end with the Pitch, Hit and Run Competition. He and his family watched the Home Run Derby and the All-Star Game, he tried the different activities at Fan Fest and he received an autographed baseball from Hall of Fame reliever Rollie Fingers. To cap off the trip, the Witazeks also went to the San Diego Zoo and Sea World, where Tyler got an up-close view of the orca whales during their show. Now that Tyler has returned from the West Coast, he is focused on the next round of games for Guilderland Little League’s 8-and-under travel team, as well as basketball camp. However, Tyler said baseball has caught up to basketball on his list, thanks to his experience in San Diego. “I keep thinking I like basketball a little more, but I actually like them both the same,” said Tyler. And, Tyler wants another crack at the Pitch, Hit and Run Competition, which is for ballplayers ages 7-14. “Next year is Miami, so I’m hoping to get there,” said Tyler.